September 7, 2016 – The Space Foundation is announcing a Call for Abstracts for the Technical Track presentations to be delivered on April 3, 2017, as part of the 33rd Space Symposium. Tech Track sessions offer registrants an opportunity to hear from government and industry leaders in space technology development, and to learn about recent advances from presenters in a series of 20-minute tech talks. Abstracts will be accepted until November 18, 2016, and authors will be notified of acceptance by JanUary 13, 2017. Presentations are welcome on technology developments with applications for civil, commercial, entrepreneurial and national security fields. The emphasis should be on recent activities or emerging technologies. 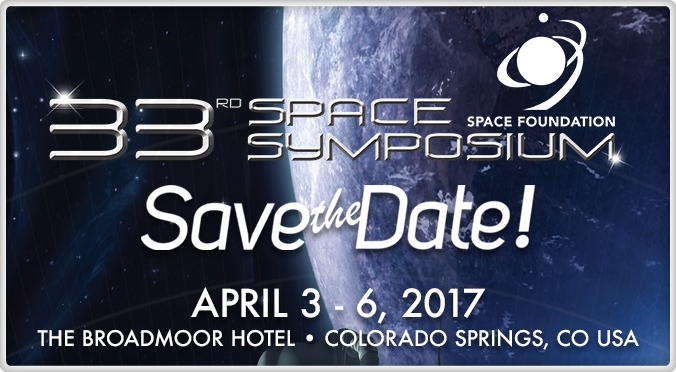 The Space Foundation’s 33rd Space Symposium will be held April 3-6, 2017, at The Broadmoor in Colorado Springs, Colorado. This premier global space conference annually attracts thousands of space professionals from dozens of countries. Registration for the 33rd Space Symposium and its Technical Track will open in October 2016.